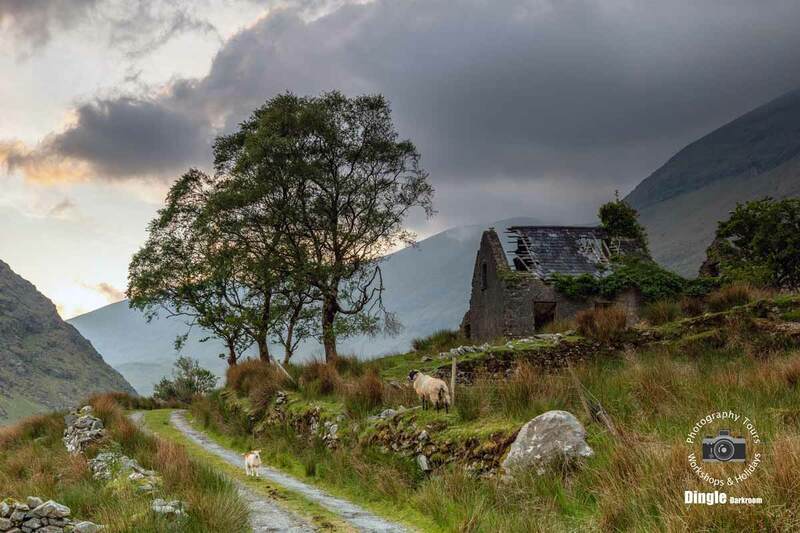 We leave Killarney and take the peaceful narrow lanes and mountain passes that circumnavigate The McGillycuddy Reeks, passing by lakes, woodland, farmland, atmospheric ruins and exploring scenic valleys that were formed during the ice age. Following a late afternoon break in Killarney, we’ll continue our tour finishing along the shores of the lakes and woodlands of The Killarney National Park, hopefully catching some colour in the sky to end the day. As ever with Dingle Darkroom Tours we’ll take the back roads wherever we can, stopping in on some rare gems along the way. The tour leaves Killarney at 9.00 a.m. and returns late afternoon for a break before continuing until sunset & dusk. The latest we should arrive back in Killarney is around 11.00 p.m. during mid summer. 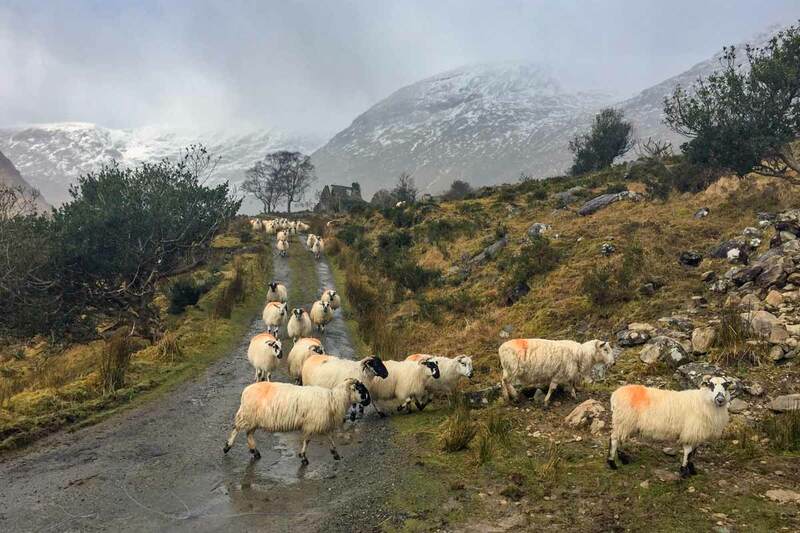 For a more detailed description of this tour, please see our pages which describe The Ring of The Reeks and The Killarney National Park tours. It’s a good idea to bring packed lunch and a drink with you, although there will be plenty of opportunities to get drinks, sandwiches, snacks and get the use of facilities during the day and we’ll take a longer break in Killarney before we head out again, for the evening. If the weather is forecast to be poor on the planned date, the tour will be arranged to the nearest fair day, if you can’t participate on the alternative day a full refund of any deposit or payment towards the tour will be made. Glacial valleys, lakes, mountain streams, rivers cascades and waterfalls. Woodland, forests, peat bog and farmland. Atmospheric abandoned houses, stone walls and ruins. All locations easily accessible using paths from the minibus. With more than 20 different locations visited during the day, this tour is reasonably fast paced and therefore not an ideal learning environment, however assistance, tips and advice on technique and composition are always available throughout the day. There’s always time to explore each location and get your tripod out if you so wish! For participants without a tripod we do have a few that can be used for the duration of the tour. This tour can run any day of the week. Please contact us if you would like to be informed with up and coming dates which are chosen a week or so ahead, using long term weather forecasts to predict a reasonable day for outdoor photography. This tour is also available at any time as a small group or individual adventure, please visit our Custom page for further information. 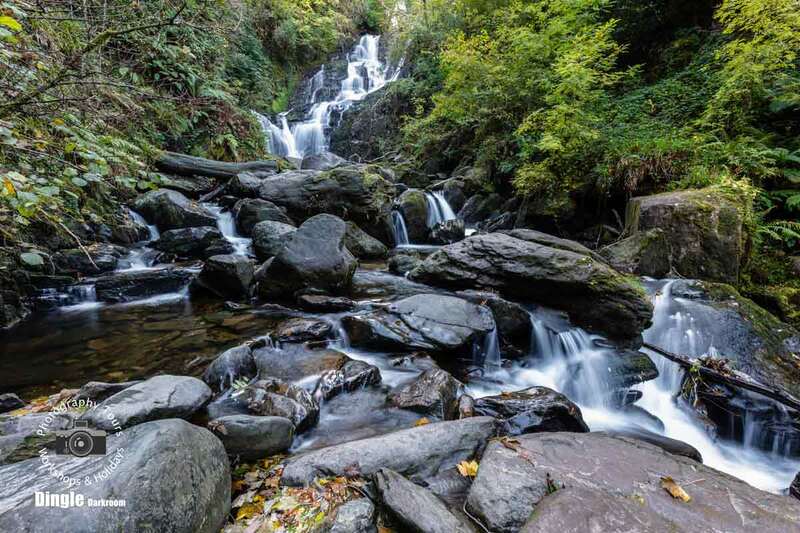 You may join this tour at Dingle around 7.45 A.M. and anywhere else while we’re on route to Killarney, including: Lispole, Anascaul, Inch, Castlemaine and Milltown, Just let us know and arrangements can be made to meet you.